> One of the great rewards of being a makeup instructor is the ability to sow into “fertile ground” and watch it bear fruitful crops. 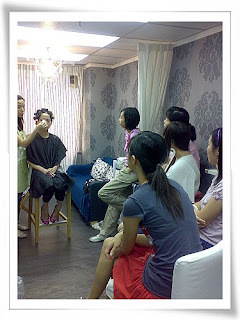 What I mean here is that many of my students who come to my makeup workshops really take to heart what they are taught in head knowledge and skill in technique, and then run with it all to launch or further strengthen their respective makeup careers. One of my most memorable students from last year was a budding young makeup artist named Lau who traveled from Hong Kong to take a private artistry fundamentals class with me along with one of my scheduled airbrush workshops. 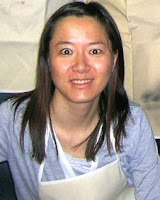 This was Lau’s first trip to the US, and her English speaking ability was somewhat limited. 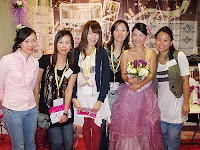 However it was clear to me that her heart’s desire was to someday grow to be one of Hong Kong’s most in-demand bridal and commercial makeup artists, and become makeup teacher herself. This petite young lady definitely showed a lot of courage and resolve to travel to Washington, DC by herself for a week and accomplish one of her major artistry skill goals. She also wanted to be the first in her region to offer professional airbrush services to her clients. Lau immediately captured the hearts of her fellow airbrush workshop students with her warm personality, sheer determination in spite of the language barrier, and display of natural talent. She was quietly reserved by nature during the learning process but extremely attentive. I was surprised at how fast she picked up on the knowledge technicals and composition, and translating them into her own creative expressions during the project phase. We all grew very fond of Lau during the two days, and it was another great example to me of how artists can quickly break through communication barriers and bond simply through their art forms. During her artistry fundamental skills platform workshop with me I was so pleased at how quickly she moved ahead with a newly expanded technique structure through this additional one-on-one workshop, and within the span of one week she made the most of all she learned and assimilated in both workshops with some amazing work she did on the live model during the laboratory phase. I got an email from Lau the other day, nearly a year since she took both workshops, and she proudly sent me photos of her very first class of students! It was a total joy moment for me and so wonderful to see how much more she has grown in her abilities. This girl was never afraid to take bold steps to make all of her artistry career goals come true. I have had students come from all over the world during the many years I have been teaching, and it is always so infinitely rewarding for me to hear about them moving ahead and achieving their artistry goals and dreams. Giving your best to others is always going to be the greater satisfaction and fulfillment in this business. It’s the one thing that not only genuinely touches others and their careers, but it’s also the pleasure knowing your reputation is branded as one who is willing to give freely and openly to empower others to their own successes.